The colorful model of a corn stem section clearly illustrates monocot vascular structure. Enlarged 550X, the peripheral cross section of Zea mays details the xylem and phloem, tracheids, parenchyma, pith, and epidermis. 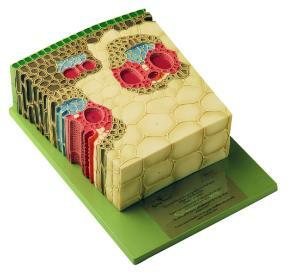 Ideal for comparison to the structure of the Woody Dicot Stem Section Model.